Today’s JEFbot does a 180 from the heaviness of the previous few strips, and the epicness of the long-running Angry Scarf storyline before that, to something a little more lighthearted and frivolous. Of course, we’ll be checking in on Xinda’s progress in the future, so stay tuned for that, but at least for today we’ll be returning to some typical banter between the Cornfather and jefbot. I’ve gotta admit – like bot here, I’m a pretty hard person to shop for since I tend to buy most of the things I want, especially when it comes to videogames and movies. But that just makes getting a thoughtful, unexpected gift more exciting, right? How about you? Are you easy or hard to shop for? And how about your family or significant others? Hope you all fared well during Black Friday and Cyber Monday! Haha, I have the same problem! I don’t know what to put on my wish list because I have what I want already! glad you could relate to today’s strip, ZAD-Man! It’s nice to see a web comic writer going out of his way to interact with his audience, makes the comic feel just that much more special ya’ know? I wish I had time to play Zelda, with the amount of work I need to do, I have a backlog of games to play as long as God’s arm! I did end up spending 65 bucks on ThinkGeek Friday morning. And only a couple things I bought were for me, honest. I NEED the Mace Windu lightsaber chopsticks!!! i try and stay away from ThinkGeek whenever i’m trying to save money! that site is evil. i’d be afraid to get you anything pokémon related, tho, dj (unless it was something special and outlandish) – you probably have everything you want and/or need there, right? Hope everyone had an awesome Turkey Day weekend! I ate too much! And then I braved Black Friday. Every year I say, “What was I thinking?! Never again!” but then there I am! Waiting for the store to open. It’s ok, got about 90% of my shopping done with a few cool things for myself. *flips hair* Because I’m worth it. Oh Exhaulted One…You’re one of those! My MOTHER does this! I try and impose a “No shopping for yourself til after Christmas.” But no one ever listens! Well, in reposting that, I put in the comment, “No wonder he visits me!.” To which a male friend I’ve known since I began to do festivals responds with “Visits you? Honey you are the standard by which naughty is judged!” Sometimes people just know what to say ya know? Working on my Angry scarf! It’s highlighter pink! I keep hoping Santa will bring it to me. Sweaters from EB and my ma paying for my PhD applications is a sorta lame Christmas (even if I’m grateful just the same). Yeah I have the exact same problem. At christmas when everyone asks me what I want, I am all like “OMG what DO I really want!”. Its a real problem sometimes. 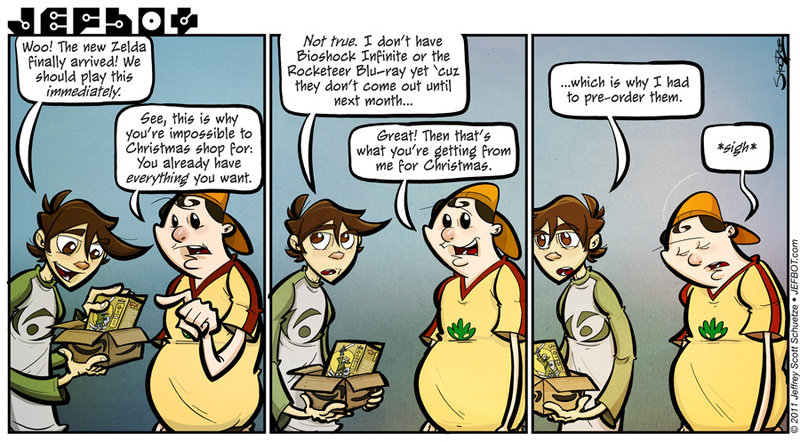 I’m a total pre-order junky as well, although this year I actually allowed someone to pre-order a game (SWTOR) for me for Christmas! And we’re even using one of those Christmas calendars with chocolate in it to count down the days till the game comes out instead of counting down till Christmas… And even though to me it’s still toooo many days away, at least I get a chocolate every day! Whee! I think for Christmas, DorkKing and I are going to get a PS3 and some games, seeing as though we both just purchased Skyrim and are tearing up the towns!! Being a gamer geek is fun! Isn’t Skyrim epically amazing? It’s just so easy to lose track of time in that game. Of course, it doesn’t help that there is no convenient clock for me to look at while I’m gaming. OMG I just get lost in there…picking up stuff, moving stuff, killing stuff! Oh and the cheats make all of it extra special. I usually have something on my wish list, but this year I just can’t think of much that I want. Oh well, I’m sure something else will pop up before Christmas. And Jeff, I noticed that you finally managed to get onto XBL the other day. Hope we can play some games together soon. Jeff, I seem to be having trouble with the site recently. You may want to check to see if something is wrong like a virus. I generaly like all gifts, so I think of myself as someone for whom its easy to shop for. However, I like to give gifts that are useful and that makes hard for me to shop for someone else. So usualy I just pick something funny as a gift, those things are easy to pick. Top of my wish list: Power Of Scrawn T-shirt!!!!! The real problem is my non-techie, non-geek husband! What do you get for a guy who doesn’t want computer gadgets or stuff for the home theater system??? Every time I think of a cool gift for him, I realize it’s REALLY a gift for me. BAD WIFE. Ha! I love it. Guys are always hard to shop for in my opinion – possibly because I am not one and have a hard time identifying with the Y chromosome sometimes. It is even worse when they already buy everything they want for themselves! I think I am really easy to shop for – I like pretty, cute, sparkly, colorful, and/or yarny things! I sent my mom an epic list of Etsy shops I like for her to shop from. That should make things pretty easy. I’m easy as long as you get a ranked list of the books I want in advance. There are always too many of them for me to buy myself anyway. For those who don’t like to find out what I want in advance there’s two ways: look at my bookshelf, choose an author, find out if he/she has retold a fairy tale that I don’t already own and get that OR choose a strong female character from history and get me a biography about her. My boyfriend offered to buy me a Nook this year. I think he’s worried that we may drown in a sea of books. What do you get for the man who has everything? Gift cards. You know what always makes an excellent Christmas gift? CA$H! LOL. I love that you pre-order! Hilarious. Ya know, I’m probably the easiest person in the world to buy for! I love pretty much everything! And I’m so thrilled that you even thought to get or make me anything I’m completely flattered! Anything Betty Boop, Alice in Wonderland, Wizard of Oz, Star Trek, Star Wars, pink, purple, Hello Kitty, crafty (either handmade or stuff to make things) video games, movies, books, gift certificates, homemade noms….Yeah I’m pretty easy…oh and pj’s…me lova da pjs! For my family and friends, Christmas is either a hollow and forced tradition(Family) or a time to have an excuse to give/demand things with a smirk(friends). So when it comes to family, I just say “Forgo the gift, just give me money to spend on things at a later date.” It works out better than getting a mountain of ill-fitting garments. I know people who are hard to shop for at christmastime, my parents. I dunno if it’s true with you guys as well. Thoughts JB? Sadly this is yet another thing you and I have in common besides our first name. Almost every game or movie I want I reserve months in advance. Sadly though it can some times come back to bite me. Right now my wife is hiding my copy of Assassin’s Creed Revelations until Christmas… even though I was the one that picked it up at midnight! Now where did she hide that frickin thing……. After Black Friday, my family makes me take a reluctant vow that I won’t order anything fun for myself without consulting with them first, on pain of . . . pain. Got my first head thump Saturday over Zoe Sharp’s latest novel — won’t be released in the US in hardcopy until January, but it’s in eBook now. . . I was just looking at it . . . with my credit card in my hand . . .